Description: This game contains 3 discs. Box Text: AN EPIC ADVENTURE IN A VAST AND MYSTERIOUS WORLD! Lead your friends on an amazing journey through an immense and visually stunning world. Empowered by Shadow creatures, your party begins a bold adventure to reveal the truth about the evil Nene and save the world! -Delve into this deep and expansive story set amidst a richly vivid world of action and intruige. -Experience dynamic new combat! 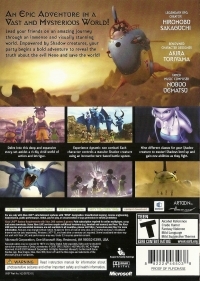 Each character controls a massive Shadow creature using an innovative turn-based battle system. -Nine different classes for your Shadow creature to master! Shadows level up and gain new abilities as they fight. 01-24-2016 pacpix Box Text AN EPIC ADVENTURE IN A VAST AND MYSTERIOUS WORLD! Lead your friends on an amazing journey through an immense and visually stunning world. Empowered by Shadow creatures, your party begins a bold adventure to reveal the truth about the evil Nene and save the world! -Delve into this deep and expansive story set amidst a richly vivid world of action and intruige. -Experience dynamic new combat! Each character controls a massive Shadow creature using an innovative turn-based battle system. -Nine different classes for your Shadow creature to master! Shadows level up and gain new abilities as they fight. 04-10-2013 artikskarab Description Three friends: Shu, Kluke, and Jiro decide to fight back against a strange monster which ravages their villiage every ten years. After confronting the creature, they discover all is not what it seems. 12-27-2012 artikskarab Box Text AN EPIC ADVENTURE IN A VAST AND MYSTERIOUS WORLD! Lead your friends on an amazing journey through an immense and visually stunning world. Empowered by Shadow creatures, your party begins a bold adventure to reveal the truth about the evil Nene and save the world! -Delve into this deep and expansive story set amidst a richly vivid world of action and intruige. -Experience dynamic new combat! Each character controls a massive Shadow creature using an innovative turn-based battle system. -Nine different classes for your Shadow creature to master! Shadows level up and gain new abilities as they fight. 12-27-2012 artikskarab Description Three friendsÂ Shu, Kluke, and Jiro decide to fight back against a strange monster which ravages their villiage every ten years. After confronting the creature, they discover all is not what it seems. 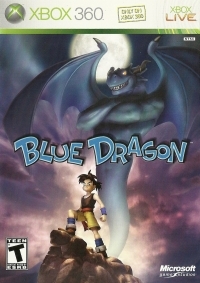 This is a list of VGCollect users who have Blue Dragon in their Collection. This is a list of VGCollect users who have Blue Dragon in their Sell List. This is a list of VGCollect users who have Blue Dragon in their Wish List.